Occupational therapists are known for using the term , the just-right challenge. The term was originally coined by occupational therapy Dr. Jean Ayres and later used in other occupational therapy frameworks. The just-right challenge can be looked at from many different points of view and becomes a little more complex when assessing this in children. I say this because adults have such a large influence on the environments they present the children with. For instance, every adult has their own individual perception of the world and what they find easy and challenging. The adult then has to either pair their point of view or shift their point of view in order to create situations that aren’t too easy for the child that there is no satisfaction in the activity, but also not too hard that the child feels so frustrated they stop trying to meet the challenge. To press further on this, there are also so many different types of parenting, teaching, and coaching styles, which adds another layer of complexity when it comes to challenging our children with some adults presenting with an authoritative outlook, some with a passive outlook, and some with a balanced outlook. How the environment is laid out for the child will influence how he/she perceives stress, how they go about completing tasks, how they interact with others, and how they see themselves and their abilities. For simplicity, I offer an analogy of how I approach creating a just like challenge for children. I see myself, the adult, as the earth and the children as the seeds. As the earth, I am a steady, enduring medium in their environment. I am taking it all in, monitoring by sensing what is going on inside me, what is going on around me, and sensing how the child is sensing the situation. I know as a seed, they are going to need just enough sun, just enough water, and just the right timing for the blooming of the flower to occur. If we overdo or under-do during a time of growth, we take away opportunities for the flower to bloom and to flourish. Again, we are monitoring, pacing, and making the child feel safe as we plot out the environment. As we know, life is organized and disorganized all at once. The best is when we see the seed coming out of the ground, starting to sprout. However, there are other times in the process where either us the adult or the child have complications that arise and we have to problem solve not in a way that fixes the situation and makes it perfect, but challenges us as we patiently wait for the development of what we planted. Perhaps there was a lack of water or maybe the sun didn’t come out one day. Sometimes that happens. Perhaps the flower is feeling lonely or they are upset because they are not growing as fast as other plants. The flower may not want to wait and they want to be a full grown flower RIGHT NOW! We get it right? But our job isn’t to just fix all that for the child or to bear down on them with unrealistic expectations. We can’t neglect the flower and we can’t pull the flower up from the ground and make it grow. It just doesn’t work that way. Our job is to be that steady ground, never wavering, showing up, shifting with what comes up in the moment. And in all honesty, it feels good to meet a just-right challenge. Enduring roadblocks, boredom, and some uncomfortable feelings is worth it when you begin to master and adapt to what shows up. Give yourself just-right challenges! Where are you too hard on yourself and where can you implement a little more discipline? Once you have an idea how you operate, then you can observe how your child operates. 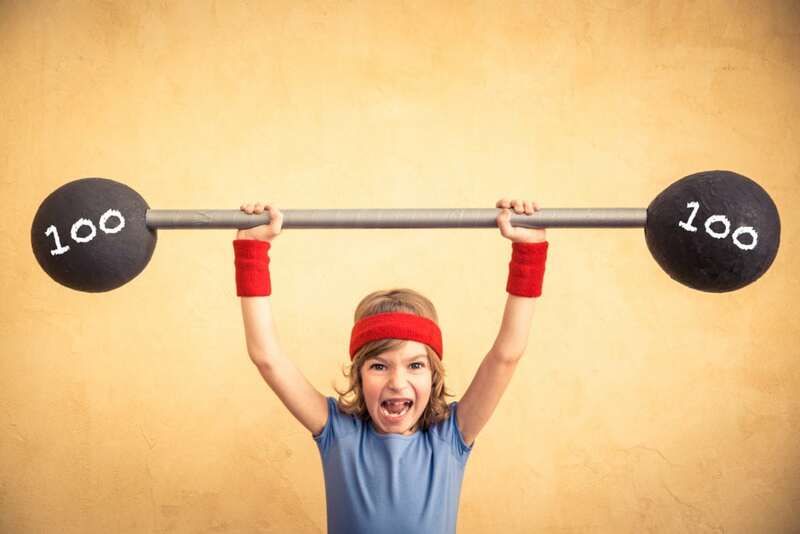 Make a list of child’s strengths and weaknesses. In what situations do they thrive and what things hard for them? Once you know your child’s strengths, really highlight those! We all have a purpose, talents, and gifts. Put them in just-right situations and let them shine! Once you know what is difficult for them, create situations that you feel are doable and allow for room to adjust to either something more simple or complicated. Example #1: Your child is afraid to ride their bike. You have been pushing them to ride out on the street, telling them it is not scary, encouraging them that they can do it. You see they can sit on the bike and even pedal the bike, but looking down that long sidewalk seems daunting to them. This is showing you, the challenge is too hard, even if it doesn’t make sense to you. You would make the challenge easier by practicing pedaling in the driveway. Then the next challenge would be riding to a cone you put out or a certain crack in the pavement and with each mastery, going a little further. Example #2: Your child despises handwriting. They may cry and scream, refusing to participate. Once you get them to the table, they scribble on their book or do everything but practice making the letters. You might not know if they find it boring, meaningless, or maybe it is really hard them. So your next step is to explore. The next time handwriting practice comes around, you don’t avoid writing in the book, but you add a fun element. Perhaps they can make their letters with chalk and use a wet sponge to write over the letters. Maybe you write letters on their back with your finger and they have to write out what they think the letter was. These additions will help not only help them sensory-wise by adding different tactile mediums, but will also make the task feel more playful and purposeful. Once you have done this, then you write just a few letters or words and you can graduate the amount over time. Another example is having them trace letters if the task is still too hard. Just-right challenges add up! It might seem at times what you are doing isn’t making a difference or that it’s taking a long time to master a skill. However, all kids benefit from persisting and embracing challenges. Remind your children of how far they have come and how far they can go. Allow frustration and failure. These are ok things to experience and they will not hurt your child! I am not talking about extreme frustration and failure because that’s not just-right. It can be so hard to watch a child struggle, but I feel when I let them struggle, I am really telling them that I trust them, that they got it, and I know they can move through whatever the challenge is. It’s very empowering to the child. 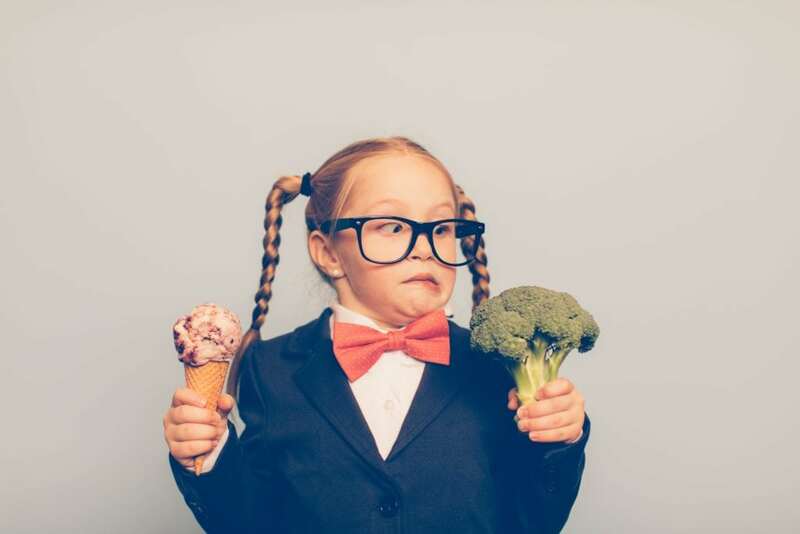 A young female nerd dressed in bow tie and eyeglasses is deciding between eating an ice cream cone or broccoli. She is making a disgusted face at the broccoli. She is choosing the treat. I am sure that there are many parents out there that have the struggle of getting their children to try new foods and adding those foods consistently to their repertoire. Literature shows that approximately 25-40% of typically developing children and up to 90% of children with disabilities have issues related to feeding and eating (Clawson, et al, 2008, O’Briend et al., 1991). A child’s acceptance of food is influenced by their biological make up, their culture, and their individual experiences they have around food. There is a developmental, sensory-motor process to introducing different food consistencies to an infant and child. The infant will start with breastfeeding or bottle feeding since they are suckling and sucking with very primitive fine motor abilities. As the baby’s head and trunk stability develops, pureed foods can be introduced. From there, more solid foods can be added as the baby’s ability to manage and chew food becomes more efficient. As the baby ages, they begin to pick up food with the fingers, manage a sippy cup/open cup, and begin to use utensils. Challenges with recognizing or managing food textures, temperature, and tastes as well as oral motor or fine motor challenges, can all influence your child’s ability to try new foods and to continue to expand their food repertoire. Children also go through developmental phases of rejecting previously accepted foods and they can also become picky with trying new foods. These phases are not long -term and if they continue for a long period of time, these issues could be related to other sensory-motor or social-emotional difficulties. Interestingly, there is literature indicating that taste buds are influenced by what we eat. For instance, if the child eats processed foods and then you try to introduce a whole food such as a piece of fruit or vegetable, the child may perceive the whole food in a completely different way due to the processed items their taste buds are accustomed to. The child may not accept the food you’d like them to try because of the other foods included in their diet. It’s similar to when you try to eat healthy. At first, it’s so hard to stop eating the processed food. Once you get on a roll, you wonder, “Why was it so hard for me to stop eating that? I love vegetables!” Then after a while, you might start to eat “cheat foods” again. Next thing you know, you feel like you are picking up your baby spinach like a stack of hay and painfully enduring every bite, while you dream of your next favorite splurge. Kids are no different! Lastly, food and drink consumption is not just a part of our survival mechanism, but it is also a social experience. We commune and celebrate life through food with friends and family. We begin to create associations between our emotions and the foods we eat. Some associations can lead to unhealthy eating habits, taking us away from food for nutrition and positive communing with others. Some of us comfort ourselves and our children with sugary or salty processed foods when we feel sad or lonely. Some of us have intense conversations during mealtimes, leading to negative associations, which affects the food experience. A parent may become upset and get involved in a power struggle over the child eating his/her food, which leads to mealtimes becoming an enduring experience rather than a relaxing, enjoyable experience. Walk the walk! If you want your children to eat fresh, wholesome food, then you, the parent needs to be an example of that. It’s good for you and it’s good for them. If you don’t eat fresh foods, you will realize that your taste buds aren’t necessarily craving those vegetables, but rather something processed liked a bagged snack or sugary treat. It’s a group effort to train the taste buds in the family so your bodies recognize the food that will keep them vibrant and healthy! Shift your mind from the American children’s menu! Yes, children tend to prefer more bland, simple foods as they are developing, but it doesn’t mean we should feed them fried foods, processed foods, and sugar-filled foods. You can make simple foods and keep them healthy. I love Joy Feldman’s cookbook, Joyful Cooking: In The Pursuit of Good Health. It has a wealth of information about preparing fresh foods and she also has a section of fun ideas for kids. Some children like the spicy, salty, sour and more flavorful foods! It’s also important to know that some children need the extra taste in order to recognize the food they are eating. There are many spices and herbs to enhance the taste of food. Children are smaller than parents so you want the meal to be appropriate to their size. Some kids will feel overwhelmed by the expectation of eating a lot of food and just won’t eat it all if the plate looks as big as them! Your child’s plate should exude compromise! What I mean is that the plate should have 1-2 things they like to eat and 1 thing you’d like them to try. There is no bribing or guilting them if they don’t eat the food. However, there is also no extra food given to them if they are still hungry and they haven’t eaten what was offered. If you have a child that is strong-willed and refuses to eat the offered food or you have a child that is not ready to accept that food for other reasons , you will want to plan for healthy, smaller meals or snacks in between so they have more intervals of eating. Don’t give up! It can take up to 25+ times of food exposure before a child might eat a food. That’s a lot of times. So just be patient as you expose them to the foods. Eat at the good ‘ol kitchen table! Some parents don’t realize how much their kids are snacking and drinking because they don’t sit for a proper meal. Parents are usually busy and on-the go, so I realize this is hard, but it’s a good habit to teach children to stop and eat. It is also a good habit for you too! Move those bodies! Mealtime can feel long to a child and you may find that your child doesn’t want to sit to eat. You may even find yourself chasing your child around the house trying to get them to eat their food. Instead of that, have your child jump on a trampoline, rock back and forth on a therapy ball, get some bike riding or swinging in, or wheelbarrow walk them to the table so they get out all their wiggles out before they eat. If you feel you are having a really hard time getting your child to eat, you may need a referral to an occupational therapist or other specialists to rule out other aspects that may be impeding their eating development. You can contact your local occupational therapist and inquire about feeding supports. In today’s world, we have many food options (or at least we are led to believe we have “food options”) and it’s no wonder that parents are up against so many food struggles. Be patient and kind with yourself and your children. Your job is to present them with opportunities to eat fresh foods and their job is to eat it. May you and your children be vibrant and healthy! Clawson, B., Selden, M., Lacks, M., Deaton, A. V., Hall, B.,& Bach, R. (2008). Complex pediatric feeding disorders: using teleconfereing technology to improve access to a treatment program. Pediatric Nursing, 34(3), 213-d216. Feldman, J. (2012). Joyful Cooking: In The Pursuit Of Good Health. O’Brien, S., Repp, A. C., Williams, G. E., & Christophersen, E. R. (1991). Pediatric feeding disorders. Behavior Modification, 15, 394-418. My first several jobs as a therapist were in the school setting. One of my responsibilities was to teach handwriting to the students. I exposed them to many choices of pencil grips, papers, curriculum, and other strategies to help students improve their handwriting skills. I also was involved in educating teachers and other staff in these strategies so the students could use them on a regular basis. The challenge I found was that each classroom was using a different curriculum so the style being taught was not necessarily uniform. Children would report confusion with the styles being taught from one year to the next, including terminology that was being used to teach handwriting. The other issue that seemed to occur was their seating position. Some classrooms had children of different heights sitting at one table or children were provided with desks and chairs that did not meet their postural needs. This created less stability for children while trying to produce legible written work. Materials were also another issue as each classroom had different types of pencils, papers, and worksheets that did not meet every student’s needs and were not always age appropriate. After seeing all these challenges, I began to search for other avenues to teach handwriting. I had heard about Handwriting Without Tears and about 2 ½ years ago, I decided to attend the Handwriting Without Tears conference. I thought the curriculum was excellent because it was developmentally based. The materials are user friendly and can be used with children with a variety of needs. I also like that the products are a reasonable price and the curriculum is easy for parents and teachers to learn. I then went on to get trained in the Print Tool, which is a handwriting assessment. I feel this is a great assessment as it measures 8 components of the child’s handwriting and gives a clear picture of what aspects of handwriting need to be addressed. Once I completed both of these courses, I then decided to become a Level 1 Certified handwriting specialist. Handwriting Without Tears is the curriculum that I choose to use in combination with other therapeutic modalities. I am sure there are many parents as well as teachers out there that are wondering if technology will soon take the place of paper and pencils. Perhaps at some point this may happen. Electronics are becoming a means to provide children with information and to express themselves. However, the literature is indicating that there is still an importance for handwriting and there is still a need to develop handwriting skills. According to a research review conducted by HWT in 2009, handwriting continues to be a primary tool for assessing children’s knowledge in the classroom (Feder and Majnemer, 2007). 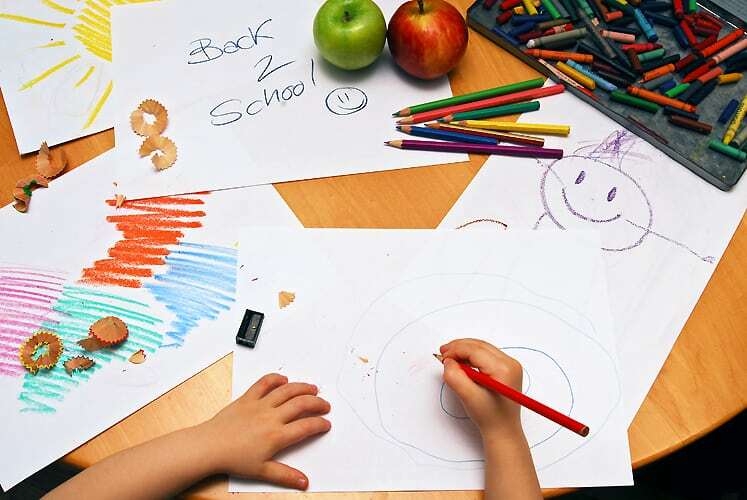 Another studied conducted by Marr, Cermak, Cohn, and Henderson (2003) indicated that children in kindergarten are now spending 42% of their fine motor time on paper and pencil activities during the school day. Handwriting skills are also important, as they are part of many state standardized assessments. In 2005, a handwritten essay was added to the College Board SAT. Graham and Harris (2005) did research that indicated that handwriting plays a major role in producing creative and well-written text. The research review by HWT (2009) supports the structure of their curriculum. In 1996, the National Association for the Education of Young Children recommends that infants through eight-years of age learn best when the teaching methods are developmentally appropriate. The Handwriting Without Tears curriculum focuses on this with the variety of materials and activities i.e. making a person with wood pieces and other materials; drawing a person; coloring; pre-writing strokes; sensory-based materials (dough, chalk, sponges); and music. HWT curriculum also focuses on the biomechanical skills that are required for handwriting. Rosenblum, Goldstand, and Parush (2006) found that children that demonstrated insufficient posture, fine motor skills, and positioning were less proficient in handwriting than children that had sufficient biomechanics. A study done by Smith-Zuzovsky and Exner (2004) pointed out the connection between the quality of children’s hand skills and their seated position. The Handwriting Without Tears curriculum includes instruction in checking seating as well as activities to promote good posture, paper positioning, and writing utensil grip. The other question parents may have is how will their child develop good handwriting skills and who will teach them these skills? A 2007 national survey indicated that only 12% of teachers rated their formal preparation to teach children handwriting as sufficient. A study done by Graham et. al. (2007) suggests that professional development should be available to teachers in order to prepare them for handwriting instruction. Parents can seek out handwriting workshops in your area or seek out an occupational therapist to conduct group instruction with your child along with some of their peers. As cited in Medwell and Wray’s literature (2007), children that were enrolled in an 8-week handwriting intervention program produced more legible handwriting then their peers, with a 46% increase in the quality of written text. This literature indicates the importance of children receiving daily, supervised handwriting instruction. Parents can also seek out individual occupational therapy services to help your child develop age appropriate handwriting skills. The occupational therapy services can provide your child with a combination of treatments in conjunction with handwriting instruction. I have found when the child is responsive to treatment and the family has strong carryover of therapeutic activities, that not only does the child’s handwriting skills improve, but also their sensory-motor skills and social-emotional skills. I have also found that teachers are able to provide suggested strategies and materials to the student with much success. I have seen many children have great success with the HWT program and I look forward to continuing to help children develop stronger handwriting skills. There was a recent 3-part series in the February 2012 issue of OT practice about working with people with Autism. The first article was written in regards to authentic partnerships with people with autism. There was a 23-year old young man named Paul that shared his insight about what is was like to have therapists working with him and the importance of these practitioners having expectations for him. At age 14, he was able to type out his thoughts through a technique called the Rapid Prompting Method. He expressed that it was important that people believe in his ability and that the people around him had expectations for him when working on specific goals. Research has indicated significant differences in a person with autism’s receptive (language the person understands) language skills and expressive (what the person verbally/physically expresses) language skills (Dawson, Soulieres, Gernsbacher & Mottron, 2007). The young man Paul reported that he understood what others were saying to him, but was not able to express this knowledge or verbally communicate with others. He pointed out that before he was able to express himself through keyboarding, other did not expect him to participate in conversation and would carry-on conversations without him. Recent literature has revealed significant discrepancies in determining a person with autism’s intelligence at all ends of the spectrum because the standardized tests rely on expressive verbal responses and demonstration of motor skills (Dawson, Soulieres, Gernsbacher, & Mottron, 2007; Estes, Rivera, Bryan, Cali & Dawson, 2010). The inaccuracy of these results impacts society’s perception of these individuals’ abilities and ultimately impacts their quality of life. The young man Paul in the article was quoted giving advice to professionals, “Always acknowledge a person’s intelligence and they will be more receptive. Often we can be perceived as being unintelligent and it can diminish the relationship between teachers and students. Structure and forceful instruction are important to help initiate activity” (Kotler & Koenig, 2012). Paul also felt that it was important to build as much independence as possible. He felt that learning self-help skills are critical in order to live independently in the future. He felt that therapists play a major role in breaking these tasks down and practicing them regularly in order to acquire the skills. He also discussed his perception of relating to others. He expressed that he can feel empathy towards others, but often times, he cannot express those emotions in a way he would like. For instance, he may be able to type out his feelings, but would prefer to hug the person. However, when attempting to physically comfort another, he became disorganized in those emotional situations and he was unable to express his feelings. Paul expressed that he would like to see therapists acting in more personal ways such as recognizing a person’s disorganization and helping them connect their minds and emotions to their physical responses (Kotler & Koenig 2012). Paul expressed that occupational therapy has improved his sensory processing skills through the use of sensory diets so that he can use strategies that support him during different states of anxiety. Paul also expressed that daily activities were arduous for him and he wanted to hear from others during those learning experiences that he was learning, that he could have a typical life, and that he could be independent (Kotler & Koenig, 2012). Paul was asked about what he thought his strengths were as a person with autism and how the way he processes information benefits him versus thinking of those ways as dysfunctional. His response was, “ I never dream I’d reach the level I have. I thought I was trapped forever without a voice. It is so mind blowing to face having my autism as part of me, but not defining me. Very liberating” (Kotler & Koenig, 2012). He also gave advice to practitioners about focusing on a child’s strengths first. He said, “Younger children very much need to hear that they can accomplish more than some people believe is possible. Specifically, it is very helpful to measure progress, making note of not only needs, but also talking about strengths and how those strengths overcome areas of need. Allow for success often and interpret success as the result of a person’s strengths” (Kotler & Koenig, 2012). Paul made one more statement in closing of this article and said, “I feel the answer lies in my acceptance of having autism as a positive thing. Don’t’ dwell on autism as an injury. Listen and observe and go with talents. If strengths are used to stake goals on, the autistic person each day earns respect for himself” (Kotler & Koenig, 2012). References: Kotler & Koenig (2012). Authentic Partnerships with Adults with Autism. The American Occupational Therapy Association, OT Practice, 6-9. I thought this article was great. So often we approach helping others from the way we see things and through the approaches we learn. As a practitioner working with children with autism and their families, finding a balance between the child’s strengths, and alternatives for learning and working on skills for interaction in their school and community environments is an ever evolving process. I believe that each person should find value in who they are and I do agree with Paul that we should foster each child’s sense of worth. I also agree with Paul that children with autism do need structure and support to initiate tasks. For all people involved in working with a child with autism, I believe the key is that this structure and instruction have only one agenda and that is to help the child in a way that empowers them. I feel it is not necessarily the approach one takes to teach the child because every child needs different instruction. This instruction can vary given the situation or period of time. What is critical when providing instruction is how you are “being” towards that child. Each child deserves honor and respect. The person supporting the child may feel they need to implement an environmental adjustment to reduce stress, a sensory break to re-organize, or to encourage the child through a non-preferred task. Whatever choice is made could be different depending on the situation and the person making the choice. Regardless of the approach, walk in that child’s shoes first, communicate your intentions, and proceed forward in the best interest of the child. There have been many times that I have sat with parents and after long discussions with them, we have come to a momentary stand still about how to proceed forward when a child is in a consistent state of disregulation. These have been described as regressions and it is important to carefully put a plan in place that recognizes the child’s challenges during these times and develop a plan to organize the nervous system. This is also a critical time to listen and observe the child as they are the ones that have the final say in whether the plan is effective during this time. Typically we (the adults) decide to give up our agendas and let go of our momentary ambitions for the child. In my opinion, letting go of these ambitions can be difficult as we are humans with a goal of helping a child grow and succeed. As my mentor would say, “Welcome to the human race!” which was a comment I frequently was told when I was trying to make a situation better from the only perspectives that I could imagine possible and that was to keep pushing forward! 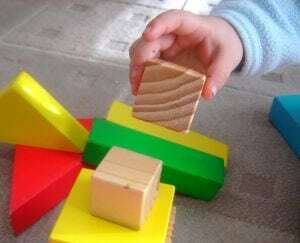 We really wanted the child to be learning the higher cognitive and motor skills. We would be trying to come up with strategies to do this, but in actuality the child needed this time for organizing the nervous system and we just simply needed to respect that. This realization often times felt to us adults that we were going backwards, but really as a team, we were moving forward because that child was empowered because we were listening to them and we were then moving at their pace. The child would start to be able to express what they needed, they would start to feel better, and in the long run, they ended up with greater participation in the therapy and had more successful learning experiences. I would also like to comment on test scores. Testing time for parents that have children with autism can be a stressful experience. 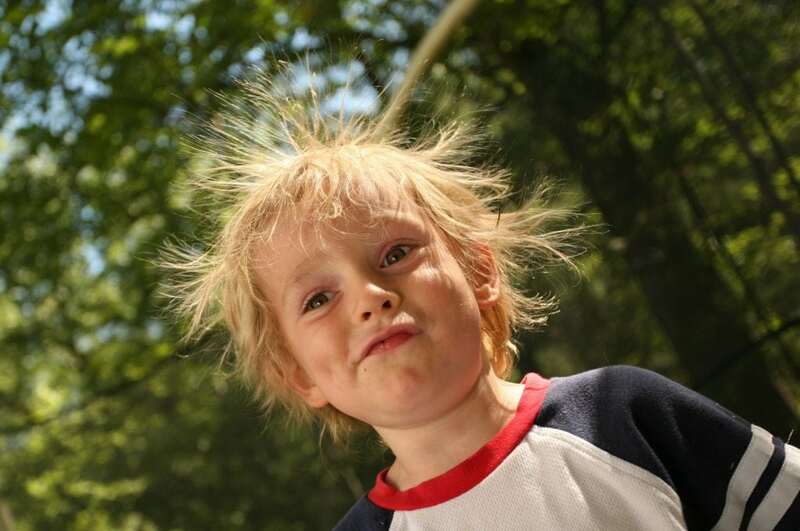 The parents often times see their child making so many functional gains in their natural environments, but yet the test results do not reflect that. Perhaps these test scores divert us away from strength-based focus. We live in a society that asks for diagnosis, measurement of ability and needs, and prognosis. On one hand, these variables give us direction and help us build a support plan for the child. On the other hand, it can also create a stigma about the child’s ability, puts a focus on their issues, and limits the perspective about what they are capable of doing when given the correct supports. However, as mentioned in the article, the skills are being measured from one focal point in which motor skills are involved and typically no assistance can be provided during the testing process. Depending on where their services are taking place or who is paying for the services, in some ways direct their plan of care. It is important that there is a blend in their plan of care by looking at all the possibilities for learning that continue to build their strengths and support them to develop needed motor skills for daily tasks. I believe it is important as a practitioner to add in qualitative data to all reports to indicate progress that has been made and to indicate approaches that are working for them in the natural environment. Paul mentioned how important the sensory opportunities were for him in order to reach optimal levels of bodily organization. Over time he was able to express his more specific needs, which then created more effective plans. Each person has specific needs and response to sensory input. Research on sensory integration has been able to guide practitioners in categorizing responses to sensory stimulation and provide a plan according to those needs. However, patients with autism can have different needs from moment to moment or within different time periods. It is important to observe and communicate with the child about those needs to ensure they are being properly met. It is also important to have an open dialogue with parents, teachers, and other people in the child’s life to ensure they are providing supportive sensory choices to the child and making adjustments to the sensory opportunities as needed. Lastly, Paul made mention of acceptance of the person with autism and helping children with autism expand their talents. Goals should be targeted for problem areas, but should be addressed using the person’s strengths to attain the goal. We fall into our place in the world because we are each unique and have different purposes. It is so exciting when a child with autism reveals a hidden talent or when they say their first word whether it is expressed verbally, with a picture, or with a communication device. It is so amazing to connect with a child that can direct you through gestures and communication devices to get their needs met. It is touching to see a child with autism hug and kiss their moms and dads with a smile on their faces. Those are the gifts they give to us. Through these special moments they teach us not to limit them, not to make assumptions about them, but to give them opportunities to express themselves in ways that are true to them. Lets not focus primarily on the difficulties, but give these children opportunities for success and joy in as many moments of their lives as possible. Let us teach others to embrace their gifts and to support them to use their amazing talents so that they too can contribute to society. It is always a pleasure to be part of these life journeys. Thank you!